We are very happy to present the call for papers for the inaugural issue for Journal of the Philosophy of Games. The journal was first mentioned as an idea at the conference in Istanbul, but now it is happening. We believe that this journal will be an invaluable tool for our community. Note that a special issue is planned for the papers from the last conference. Please help us forward the call to relevant people or lists. 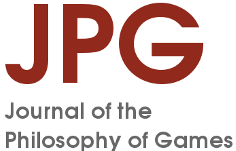 The Journal of the Philosophy of Games (JPG) welcomes papers for the inaugural issue. JPG is an open-access publication hosted by the University of Oslo, Norway. JPG aims to explore philosophical issues raised by the study of games, with a particular emphasis on computer games. We invite contributions both from traditional philosophers and from scholars in other diciplines. Articles are subject to double blind review and evaluated on the basis of originality, philosophical argumentation and mastery of relevant literature. The journal does not accept submissions that are under consideration for other publications. Examples of issues for which we invite submissions are definitions of key concepts in the study of games, the ontological status of objects and events in games, the nature and role of mental attitudes central to game play, rules, the player-avatar relationship, the moral evaluation of in-game actions or the societal role of games. Contributions should make use of specific examples of games and not merely invoke them in general terms. We welcome book reviews. Please contact the editorial board to ascertain that a review would fit the editorial profile. The submissions should be no longer than 7000 words and adhere to the Chicago Manual of Style, Sixteenth Edition. Articles are submitted electronically on the journal website. Please refer to the author guidelines. The final deadline for the inaugural issue is March 1, 2016. A separate call will be issued in 2016 for a special issue about the theme “Meaning and Computer Games” (Editor Sebastian Möring).